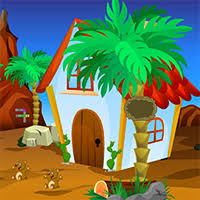 AvmGames - Avm Escape Cowboy House is another point and click escape game developed by Avm Games. You had a great childhood, but there is one incident that never left your mind. It is when a cowboy went inside the ice cream shop that you were in. This certain cowboy went wild at that time and that scared you so much. From then on, you don't want to see a cowboy ever again. However, this memory went back after your friend asked you to come over to his house. His house has a lot of cowboy paraphernalia. Your heart is pounding so hard because of this. But the biggest twist is, that his father is the cowboy that raged at the ice cream store. It just makes you want to get out from this house quickly, but you can't open the door. You don't want to see the cowboy, so you have to escape from this house before he shows up. Therefore, you have to collect objects in this house that you can use to open the door. Not only that, you also have to gather clues that can help you to solve the puzzles quickly. Good luck and have fun! Don't know why this is rated so low, it's perfectly playable, a couple of tricky sliders and some good hiding places.